Interstate 240 passes below U.S. 51-64-70-72-79 (Crump Boulevard) south through Midtown Memphis. Photo taken 06/01/10. Interstate 240 in Tennessee runs along the southern two thirds of the 31.9-mile long Memphis beltway. The northern third is designated as Interstate 40. 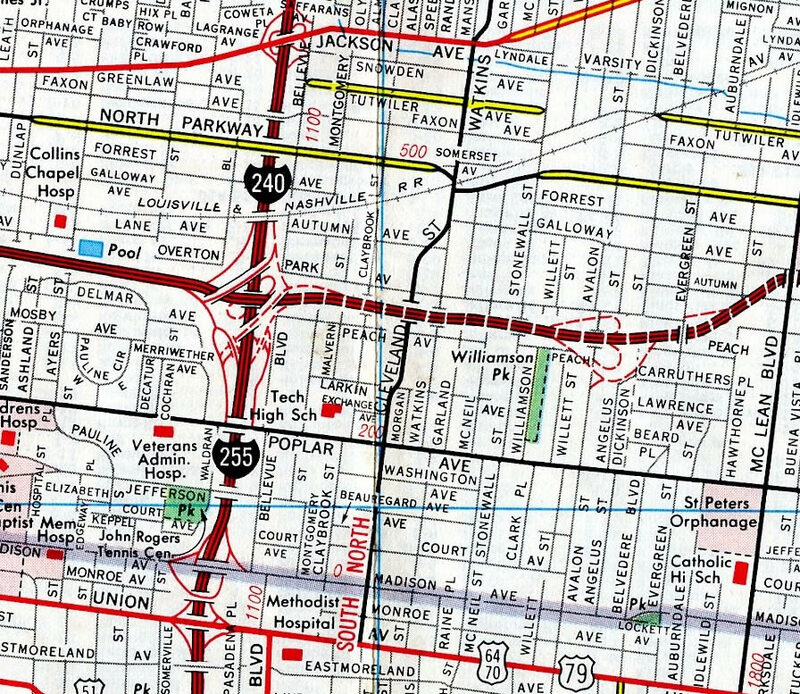 The north-south leg of I-240 from Downtown to Southside, Memphis doubles as Interstate 69. The remainder of the route provides a bypass between I-55 & 69 through northern Mississippi and I-40 leading east toward Jackson while acting as a commuter route for residents of Germantown, Hickory Hill and Parkway Village. Interstate 40 was subsequently rerouted to overlap with I-240 along the northern Memphis beltline between Uptown and Raleigh. I-240 was eventually dropped from the concurrency as approved by AASHTO on June 28, 1982. The I-40/240 overlap is one of handful in the Interstate system where a 2-digit route overlapped with its branch route. Others included I-40/440 around Raleigh, North Carolina (dropped in by 2009), I-95/495 around Washington, D.C. and I-94/694 to the northwest of St. Paul, Minnesota. The southwestern section of Interstate 240 between I-40 near Downtown and I-55 by Alcy-Dunn was previously designated as Interstate 255. This changed on November 10, 1973, when AASHTO approved the renumbering of I-255 as a northwestern extension of I-240. The ghost flyover ramp from WB planned I-40 to SB I-240 at the Midtown interchange has been removed, and the EB I-40 flyover is about to be removed. EB I-40 traffic is now diverted over the I-40 EB ghost ramp and then makes a sharp turn to the north (like a tight trumpet ramp would). Eventually those ramps will be removed, as well; the logistics of the construction staging for this interchange work must be convoluted, as I-40 will eventually be at grade level through the interchange. Looking at the former ghost ramps at the interchange joining I-40/240 near Midtown, Memphis. 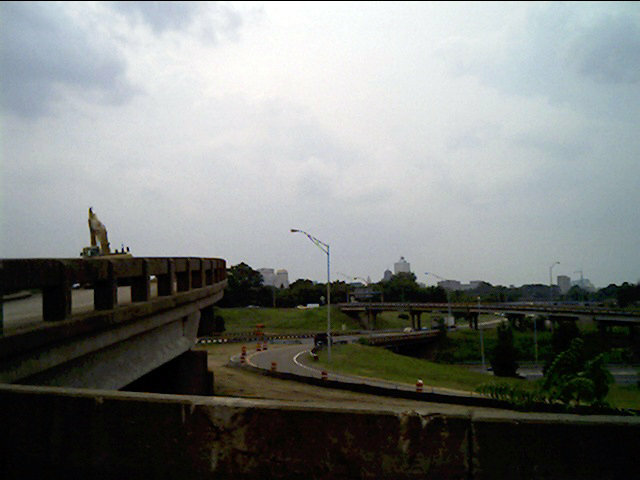 This view looked southwest from the ramp built for unconstructed I-40 west to I-240 south. The loop ramp below carried motorists from I-240 north to I-40 west while the adjacent overpass represented the eastbound mainline of Interstate 40. This exchange was rebuilt between 2003 and 2006 into a high-speed directional T interchange. Photo taken by Zach (07/18/03). Looking east from White Station Road at the steel frame work for the flyover carrying I-40 west to I-240 during Phase I construction. Photo taken by Don Johnson (06/02). The I-40/I-240 Phase II Interchange Project was previously scheduled between January 2004 and December 2006. 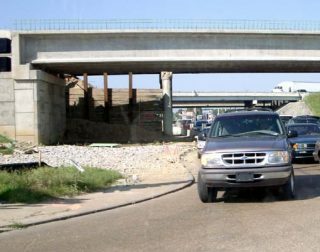 Funding delays pushed work back to 2013, when construction of the east and westbound flyover bridges commenced. The new ramps, which carry the Interstate 40 mainline above I-240 and Sam Cooper Boulevard, were completed by fall 2015. Replacement of the I-40 bridges across the Wolf River and associated widening rounded out project work by summer 2017. Interstate 69 was extended northward from Hernando, Mississippi to Midtown, Memphis on May 6, 2008. The route overlaps with I-55 north to Interstate 240, along side I-240 north to Interstate 40, and on I-40 to three-wye interchange (Exit 2A) with Tennessee 300 near Frayser. Signs erected within the Volunteer State only reference the route as a Future corridor. 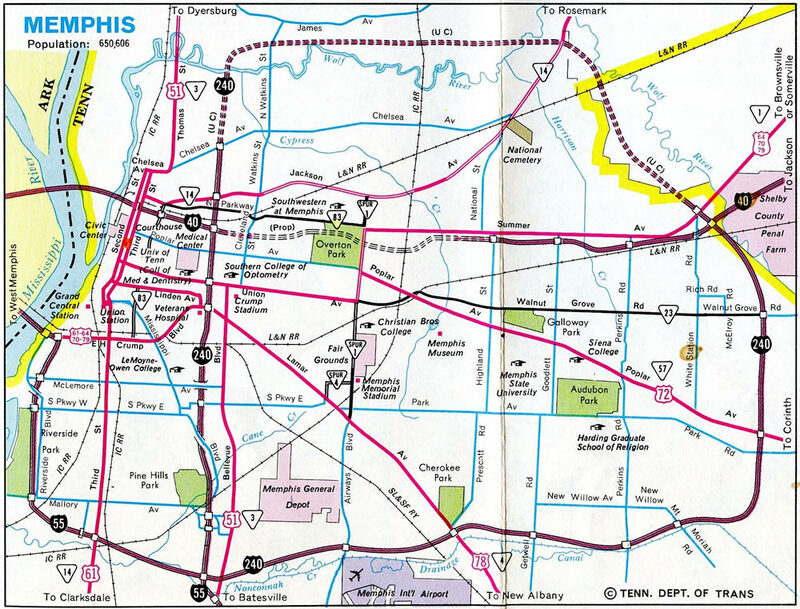 Interstate 240 was completed from I-55/255 east to I-40/240 by Brennan in east Memphis by 1964. The Interstate 255 leg of the Memphis beltway was opened north to the cloverleaf interchange with South Parkway East. I-255 is one of three Tennessee Interstates renumbered as part of another route. 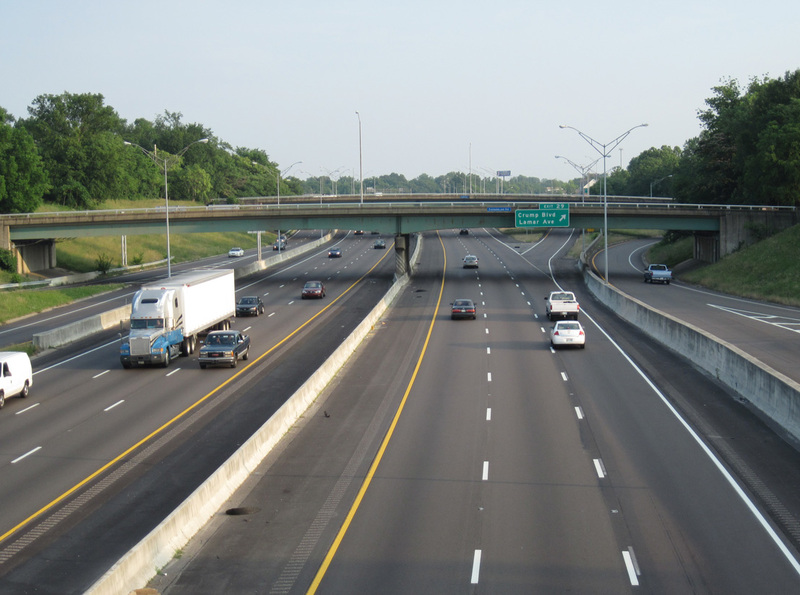 The others are I-265 in Nashville, which became a part of an I-65 realignment in 2000 and I-181 at the Tri-Cities, which became part of a two-stage northern extension of I-26 in 2003 and 2005. 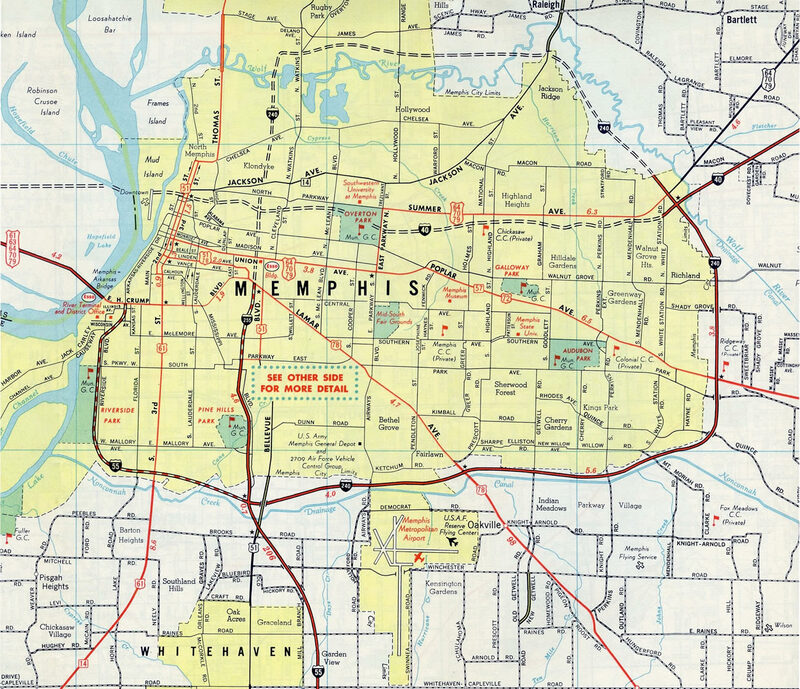 This 1972 map shows the interchange built for Interstates 40-240-255 near Midtown, Memphis. 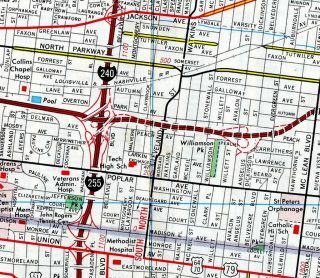 The freeway east of Claybrook Street was never built, leaving ramps at the nearby exchange unused until their demolition in 2003. All ramps at this exchange were removed as part of a $53-million project between June 2003 and December 2006.4 The I-40 mainline now curves northeast through the junction with four overall lanes while I-240 shifted to outside roadways to the parclo interchange at SR 14 (Jackson Avenue). Construction continued through 1976 on the northern arc of the Memphis beltway between Chelsea Avenue at Vollintine and U.S. 64-70-79 (Summer Avenue) at Raleigh. This view looks at Phase I construction of I-40/240 above Summer Avenue (U.S. 64-70-79). A new overpass was constructed for I-40 eastbound in the foreground. Westbound travelers remained on the 1964-overpass in the background. Photo taken by Don Johnson (06/02). 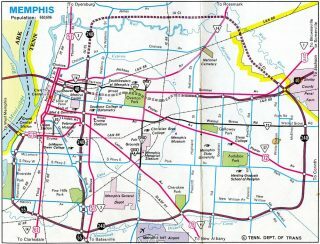 The roadways of I-40 above U.S. 64-70-79 were shifted outward to accommodate the new mainline flyovers taking I-40 to and from the Memphis beltway. Exit numbers count downward on Interstate 240 from 31 to 12 as it travels eastward. Initial construction to upgrade the exchange joining I-240 with I-40 and Sam Cooper Boulevard was underway. Photo taken by Chris Patriarca (05/03/03). A new diagrammatic sign was added during reconstruction of I-240 leading north to Interstate 40 at Exit 12C. Photo taken by Chris Patriarca (05/03/03). Interstate 240 concluded beyond what was a sharp ramp for I-40 east to Jackson and Nashville. Photo taken by Chris Patriarca (05/03/03). A left exit departed after Exit 12C for I-40 east for Sam Cooper Boulevard westbound. Photo taken by Chris Patriarca (05/03/03). Interstate 40 eastbound previously navigated through a TOTSO (turn off to stay on) connection from the Memphis Beltway at Sam Cooper Boulevard. Photo taken by Chris Patriarca (05/03/03). Westbound I-40 expanded to five lanes from Macon Road (Exit 12) to the exchange with Interstate 240. Photo taken by Chris Patriarca (05/03/03). Some lane shifting due to construction, Interstate 40 prepares to enter the Memphis Beltway. Westbound traffic not opting for the beltway will transition onto Sam Cooper Boulevard into central Memphis. This freeway spur is a remnant of the planned Interstate 40 routing. Photo taken by Chris Patriarca (05/03/03). One half mile from the Interstate 40 entrance onto the Memphis Beltway. Interstate 240 travels southeast briefly before curving back to the west to the Nonconnah Parkway and Interstate 55. Photo taken by Chris Patriarca (05/03/03). Interstate 240 begins from Interstate 40 west via this cloverleaf ramp (Exit 10A). I-240 meets I-55 in 14 miles and returns to Interstate 40 in 19 miles. Sam Cooper Boulevard spurs westward for several miles to Broad Avenue. Photo taken by Chris Patriarca (05/03/03). Exit 9 departs for Perkins Road, 1.50 miles ahead of I-40/240 on Sam Cooper Boulevard eastbound. Exit numbers along Sam Cooper Boulevard counted up from the planned route of I-40 through Overton Park. Photo taken by Chris Patriarca (05/03/03). Previously, Sam Cooper Boulevard defaulted onto Interstate 40 eastbound. Photo taken by Chris Patriarca (05/03/03). Near the Meadenhall Road overpass, Sam Cooper Boulevard enters its final half mile before merging onto Interstate 40 east. An auxiliary lane opens east to Exit 10A/Interstate 240 westbound. Photo taken by Chris Patriarca (05/03/03). Eastbound Sam Cooper Boulevard at the eastern terminus of Interstate 240, where Interstate 40 heads east to Jackson and Nashville. Sam Cooper Boulevard was to have been part of Interstate 40 had it been constructed through Memphis. However, local opposition curtailed this from coming to fruition. The roadway currently carries no route designation and is locally maintained. Photo taken by Chris Patriarca (05/03/03). Westbound Interstate 240 at Exit 30 for U.S. 72 (Union Avenue). I-240 defaults onto I-40 east ahead. Photo taken by Chris Patriarca (05/03/03). Reconstruction of the I-40/240 exchange near Downtown included renumbering Exit 31B as Exit 31. U.S 72 (Union Avenue) spans the freeway in this scene. Photo taken by Zachary Bugg (07/11/07). Interstate 240 passes under Jefferson Avenue. A collector distributer roadway connects ramps from Madison Avenue with both directions of I-40. Photo taken by Zachary Bugg (07/11/07). Prior to reconstruction of the interchange with I-40, I-240 north reduced to two through lanes below Poplar Avenue. Photo taken by Zachary Bugg (07/11/07). A flyover takes motorists onto Interstate 40 west from I-240 east and Madison Avenue. The ensuing exit along the beltway north to Jackson Avenue continues the I-240 exit numbering convention. Photo taken by Zachary Bugg (07/11/07). This flyover carried the eastbound I-40 mainline to the Memphis beltway. Photo taken by Chris Patriarca (05/03/03). APrior to the upgrade, a loop ramp (old Exit 31B) connected I-240 west with I-40 east to West Memphis, Arkansas. Photo taken by Chris Patriarca (05/03/03). Interstate 40 crosses the Mississippi River ahead of the Memphis central business district and Interstate 240 (Memphis Beltway). Exit 1B departs first for U.S. 51 (Danny Thomas Boulevard) to Downtown. Photo taken by Steve Hanudel (08/18/05). Diagrammatic guide signage preceding the entrance of Interstate 40 onto the Memphis Beltway. The forthcoming exchange represented the north end of I-255, which was the previous numbering of I-69/240 south from I-40 to I-55. Vidcap taken 05/30/95. The official Tennessee state map indicated that the Interstate 240 eastbound ramp was Exit 1E. Guide signs however omitted the exit number. Visible to the left in this scene were roadways for unconstructed I-40 east to Overton Park. Photo taken by Chris Patriarca (05/03/03). I-40 previously turned north onto the Memphis beltway along a single lane ramp. The initial six miles of I-240 travels south to I-55. I-55 continues from there to Jackson, Mississippi. Photo taken by Chris Patriarca (05/03/03). Traveling southbound on Interstate 40, one mile north of the cloverleaf interchange (Exit 1G/F) with SR 14 (Jackson Avenue) and 1.50 miles from the departure from the Memphis Beltline. Photo taken by Chris Patriarca (07/18/03). Interstate 40 westbound at Exit 1G to Tennessee 14 west. This state route concludes at U.S. 51 nearby. I-240 lies a half mile ahead adjacent to the Memphis central business district. Photo taken by Chris Patriarca (07/18/03). Interstate 40 departed from the Memphis belt line at Exit 1F. Interstate 240 begins and advances south with three lanes. Photo taken by Chris Patriarca (07/18/03). 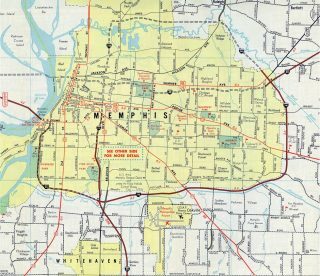 Traffic partitioned for I-40 west to Downtown and West Memphis, Arkansas and I-240 south to adjacent Madison Avenue (Exit 30) and Memphis International Airport. Photo taken by Chris Patriarca (07/18/03). I-40/I-240 Interchange Reconstruction East Memphis, Shelby County. Tennessee Department of Transportation (TDOT) project web site. 50th Anniversary, 1956-2006,” Tennessee Department of Transportation, 2006 web site. Lawrence, Chris. “Recent MS/TN construction notes.” Online posting, misc.transport.road, September 25, 2003. “Work on I-40-240 ahead of schedule.” Commercial Appeal, The (Memphis, TN) October 7, 2005.